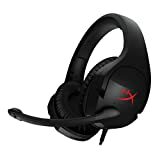 The HyperX Cloud Stinger is a gaming headset manufactured and launched by Kingston. Kingston has developed and maintained a prestigious reputation for manufacturing memory products, but in 2014, Kingston’s HyperX entered the already-packed industry of gaming headsets and its recent emergence in the market proved to be a worthy competitor for other firms. Now, it will introduce to the $50 market of gaming headsets its soon-to-be-released HyperX Cloud Stinger. The product will be released on 3 October 2016, and although it is not rated yet, these headsets look promising to bring good results to both the company and the consumers. The HyperX Cloud Stinger comprises an audacious look that is different from other gaming headsets. Instead of flamboyant colors, this headset is more subtle and professional, which instills an expert feeling in gamers and makes it a class apart. With its sleek shape and edgy body, the HyperX Cloud Stinger is striking to the eye. Although it looks pretty robust, the headset is astonishingly light and weighs about 310 grams only. This makes the headset extremely comfortable to wear for extended periods of time and prevents one from feeling burdened. Its speakers are circumaural, which makes them attenuate external noise and focus the sound directly into the ears, providing excellent sound quality. Overall, the design of the HyperX Cloud Stinger makes it seems like it is constructed for a serious job. The HyperX Cloud Stinger is made of plastic but, unlike other plastic headsets which do not last long, the HyperX Cloud Stinger is much more durable. Inside the plastic headband, there is metallic construction, which can be observed upon extending the headset outwards which ensures that the headset will last long if used properly. In other words, it can be said that the headset carries the durability of a metallic body and is comfortably light due to the plastic body. Moreover, its biggest driver is a 50mm directional driver which produces extraordinary output while distorting the sound as little as possible. The microphone of this headset has a marvelous sensitivity to sound and picks up sounds from almost every corner of the room. For muting the microphone, the microphone just needs to be swiped up and it can simply be flipped down to unmute. The material used for the ear cups is the HyperX signature memory foam, which is an absolute luxury to the ears. There is also padding on the headband, which further extends the comfort of wearing these headsets. This memory foam is a special material which provides an unparalleled experience. The HyperX Cloud Stinger is a high-end gaming headset which will be available at a very affordable price. Within its price bracket, the sound quality that it provides is unmatched to any other headset. It has an impactful bass and the only competition it receives is from the headsets priced above $100. However, this headset is only compatible with PC and PS4. The HyperX Cloud Stinger is one of the most desirable gaming headsets with high-end features being available at a low price. Its purchase will not let anyone down except for Xbox users.